Vietnam has more than 3,400km of coastline, with seemingly endless stretch of clean white powdery sand, beautiful lagoons, impossible boulder formations and tropical islands ringed with yet more beaches. Vietnam is the paradise for well-known golf course architects to come and build greatest links courses in the world. Links courses tend to be on, or at least very close to the sea , and the term is typically associated with coastal courses, sandy soil, often amid dunes, with few water hazards and generally have no trees. Links golf brings with it a special series of challenges: the nature of the courses themselves, which tend to be characterized by uneven fairways, thick rough, and small, deep bunkers known as “pot bunkers”; and due to the coastal location and lack of trees, many links courses are frequently windy. As many links courses consist of an “outward” nine in one direction along the coast, and an “inward” nine which returns in the opposite direction, players often have to cope with opposite wind patterns in each half of their round. 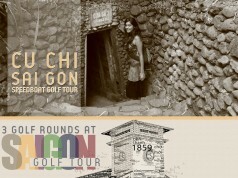 This 10-day Vietnam Golf Links tour of UniGolf will take you to great links courses that you can find in Vietnam. Day 2: Breakfast then check out, car will drive you to The Bluffs Ho Tram to play 1 golf round here. Check in then rest one night at this luxury 5-star hotel. Located on the small beach town, 2-hour drive from Ho Chi Minh city, Greg Norman’s Par 72 masterpiece is nestled among the seaside dunes of Ho Tram Strip which have been formed over thousands of years. With the wind sweeping across the beautiful fescue grasses, undulating greens and beautifully manicured fairways, the Bluffs offers enjoyable and challenging experience to players of all skill levels. The Ho Tram Strip complex is Vietnam’s first ever Casino and features 541 rooms, more than 10 restaurants, bars, night club, spa and convention centre. Day 3: Breakfast then check out, car will drive you to Phan Thiet. Check in at Sea Links Resort Phan Thiet. Sea Links Resort is seated on the untouched bay of Mui Ne and a stone throw away from Phan Thiet City, Sea Links Resort is Vietnam’s first all-resort complex integrated. Offering 188 elegant rooms and suites, four palatial-sized pools, restaurants and bars, spa, recreational amenities providing modern conveniences to every guest. Day 4: After breakfast, you will play 1 golf round at Sea Links Golf Club then check out and car transfer to Diamond Bay Resort, Nha Trang. Check in then rest here. Sea Links Golf Club in Phan Thiet is the first links golf course in Vietnam. The 18-hole golf course is designed by Ronald Fream who has designed golf courses for over 40 years in more than 60 countries. This 7700-yard course sits right in the heart of a charming countryside with white sandy beaches extending to the horizon. Sea Links is a unique golf course which offers not only a sweeping views of the ocean but also long holes and obstacles to challenge even expert golfers. Diamond Bay Resort offers 143 luxury villas which are designed elegantly and attractively but not sophisticated around the golf course. Guests can wallow in the blue sea or take part in many water sports such as Banana boat, Snorkeling, Kayaking, Parasailing, Jet Skiing. Located on the bay of Diamond, Nha Trang – one of the world’s 30 most beautiful bays voted by Forbes Magazine, Diamond Bay Golf Club is one of the few greatest golf courses in Asia possessing the breathtaking ocean views. The 76 hectare 18-hole championship golf course designed by Andy Dye sits perfectly between the mountains and the sea. 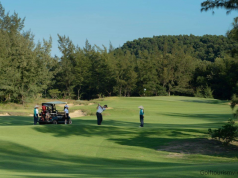 Natural marshes, majestic pines and sandy dunes, Platinum TE Paspalum grass, white sand bunkers and incredible views of Nha Trang Bay create an exceptional golfing experience here. Day 6: After breakfast, you will travel to Vinpearl Land to play 1 golf round here. In the afternoon, you can visit Vinpearl Land Amusement Park (games will be paid by guest) or go back to 100 Egg Mud Bath Center for mud bathing. Vinpearl Golf is a pioneer in the development and management of the finest golf courses in one of Vietnam’s most beautiful destinations. The course measures 6,787 yards from the longest tee. With its world class 18 holes, excellent services and breathtaking ocean views from every hole of the course, the golf course not only provides optimal technical conditions that enable players and visitors to play golf and enjoy the marvelous scenery at the same time but also gives another reason why Vinpearl is regarded as the leading resort, entertainment and tourism complex in Vietnam. Day 7: Check out then go to Da Nang. 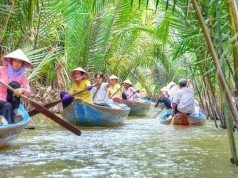 You will visit Hoi An Ancient Town – The UNESCO World Heritage then check in and rest at Da Nang. Day 8: After breakfast, you will then play 1 golf round at Montgomerie Links then depart to Laguna Lang Co Resort, Hue. Check in then rest. Montgomerie Links is perfectly located midway between Hoi An and Da Nang. The 18-hole international standard golf course which is designed by European legendary golfer –Colin Montgomerie measures 7,091 yards from the longest tee. The 2012 Forbes Travel Guide rated Montgomerie Links as one of Asia’s ten most elite courses. It has been designed to capitalize on its close proximity to the warm, tranquil East Sea and the sacred Marble Mountains serving as a backdrop. Day 9: After breakfast, you will play 1 round at Laguna Lang Co Golf Club. In the afternoon, you will visit the Nguyen Imperial Citadels & enjoy performance of Hue Folf Songs on the Perfume River then drive back to Laguna Resort for resting. Located on the Lang Co Bay which is a member of the “World’s Most Beautiful Bays” club (Worldbays Club). The 18-hole, par-71 Laguna Lang Co Golf Club is designed by Sir Nick Faldo who is widely regarded as the most successful British golfer. The course measures just over 7,000 yards from the championship tees and a beginner friendly 5,263 yards from the front tees that can be enjoyed by both a beginner and more experienced golfer. Day 10: Check out then depart to Phu Bai International Airport to fly back to Ho Chi Minh City. Previous articleTruong Chi Quan Ranks 58th At 2015 Asian-Pacific Amateur Championship.